While FanDuel ran more ads last year, its rival has had the clear edge in 2015. 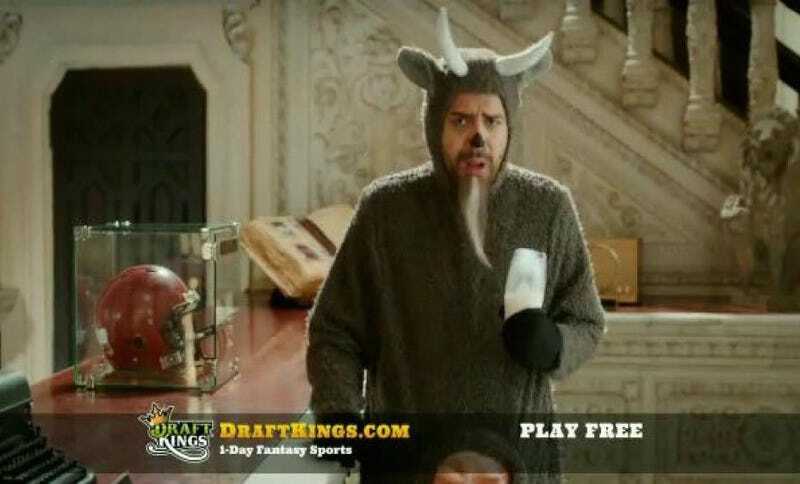 DraftKings spent $131.4 million on ads for a total of 40,283 national airings. Last year, its ads ran just 8,743 times. Over the same period, FanDuel spent $74.5 million for a total of 21,545 national airings, up from 14,017 in 2014. Please note that this covers from Jan. 1 through Oct. 5, so add in three more days of those damn things. Also note that it only counts national television commercials—throw in a few thousand more local spots, podcast reads, web ads, sponsored content, billboards, etc. Ingsoc couldn’t do any better. It’s this oversaturation of ads that turned so many people against daily fantasy and caused them to root for DraftKings and FanDuel to fail. Which is a damn shame, because daily fantasy should be a wedge into regulation and smarter legislation of sports wagering.